Ron is a gentle and gracious man who was born in South London in 1929. He began drawing around the age of 5 and writing poetry by 6 years of age. At this age he created personalised Christmas cards for the customers of his mum’s grocery store. As a “Copper” in England at the age of 24 he reignited his love of drawing as one of a few hobbies to sustain his wellbeing. During this time he developed his "self taught" skill of dot art and was able to create some quite peculiar artwork particularly of animals. Stamp collecting fascinated him, but it was only Australian stamps that were of interest to him. As he began to draw the stamps in his album, Ron designed the watermark with dot patterns to subtly show it up. Dots became a theme within his art and his passion for Australian culture led him to research and develop works similar to that indigenous art. Ron has said his style “just evolved” although he since discovered it was called pointistille. 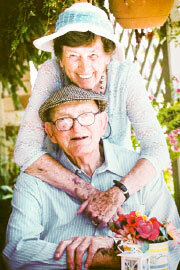 Attracted by the history and stories of the Darling Downs, Ron and his “sweetheart” wife Betty migrated to Australia with their children and settled in Warwick, Queensland in 1966. Ron’s work has spread throughout the world and can be found in a number of private collections, including the Disney Studio’s in Los Angeles. His heartfelt love for children helped him to create the art and lyrics for what he called the ‘Screaming Aussie Alphabet’ as a part of his larger exhibition at the World Expo held in Brisbane in 1988. This work was laid aside until he recently passed it on to be published into the educational art set known as The Aussie Alphabet and The Aussie Alphabet Song.